Under pressure: Low tension piston rings – BG Products, Inc. In order to reduce frictional drag energy loss and increase fuel efficiency, gasoline direct injection (GDI) engines use thinner and lighter piston rings, called low tension piston rings. Piston ring spring force in older port fuel injection (PFI) engines used to be as high as 30 psi. New PFI and GDI engines can have more than a 60 percent reduction in sealing pressure on the cylinder walls. At the same time, new PFI and GDI engine compression ratios have increased from 9:1 to as high as 14:1. These higher compression ratios dramatically increase cylinder compression and the overall pressure for fuel ignition, sometimes as high as 2000 psi. This huge increase in pressure creates more force on the low tension rings. 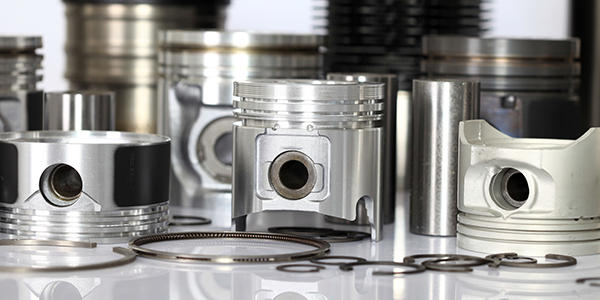 Piston rings are supposed to prevent fuel and combustion gases from “blowing down” between the piston and cylinder wall and oil from moving up into the cylinder. But, low tension piston rings have a greater tendency to allow blow-by. Crankcase contamination compromises lubrication and promotes oil degradation. Degraded engine oil is more susceptible to oxidation, which can cause engine oil thickening. When the engine oil thickens due to the oxidation, it provides even more resistance against the low tension piston rings. As oxidation progresses, sludge formation can occur. So, not only do you have sludgy, contaminated oil lubricating the rings; but also, because the low tension piston rings have such low spring force, they are less capable of pushing back against deposits that may form around them. Eventually deposits will impede the rings outward expansion to seal the cylinder wall, which will allow even more fuel and combustion gases to enter the crankcase. Or, vice versa, stuck rings can promote oil consumption and intake deposit formation due to engine oil moving up into the cylinder and into the intake. So, while new PFI and GDI engines are known for efficiency, the constant struggle between low tension piston rings and high operating pressures will eventually erode fuel efficiency and diminish horsepower. BG EPR® Engine Performance Restoration®, PN 109, is essential to keep low-tension piston rings free of deposits, which will keep them from sticking in place. Immobilized rings cause loss of power, diminished fuel economy and premature aging of engine oil. By keeping the rings clean, the compression is maximized. And if the fuel does blow down into the crankcase, BG MOA®, PN 110, will fortify the oil to help it withstand fuel contamination and maintain its essential lubrication qualities longer under the high pressures in today’s PFI and GDI engines. Use BG EPR® and BG MOA® at every oil change to help prevent problems caused by low tension piston rings under extreme pressure.